The key to maintaining low levels of invasive algae is the presence of native herbivores. 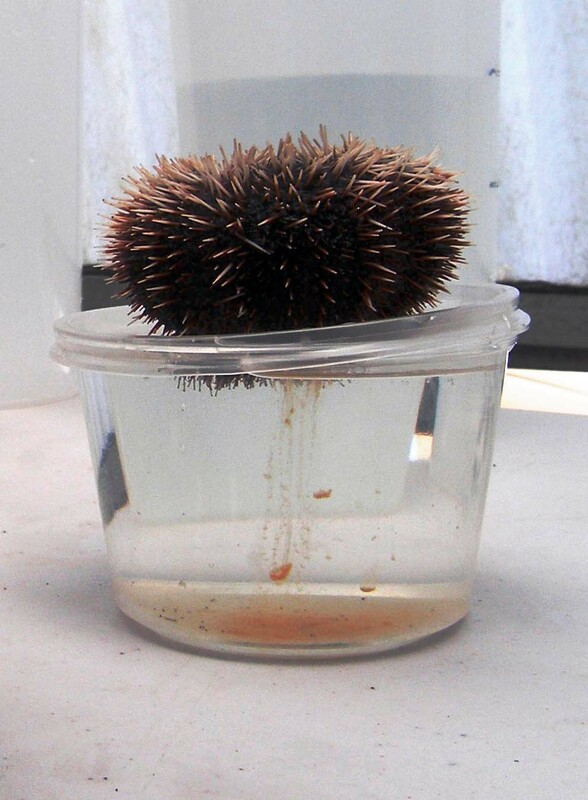 Therefore, native Hawaiian collector urchins (Tripneustes gratilla) are spawned and raised in captivity at the Division of Aquatic Resources’ Anuenue Fisheries Research Center. They are propagated as a tool to fight invasive alien seaweeds in Hawaii. In most situations, the invasive seaweed is removed by hand or by mechanical means from the troubled areas. But without a strong population of native herbivores the seaweed will grow back. After the seaweed is removed the sea urchins are brought in for the maintenance work. They nibble away at the invasive seaweed as it starts to regrow. The urchins act like underwater gardeners pulling weeds, or goats eating away on unwanted brush. They keep the invading seaweed under control so the coral can thrive. How do you raise a sea urchin? 1. 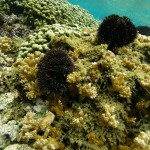 Once a month, divers collect approximately 20 wild adult urchins from various locations across Oahu’s south shore. Once collected, they are returned to Anuenue Fisheries Research Center where staff eagerly await their arrival. Staff then gently agitate the urchins to get them to spawn and release their gametes into plastic containers. 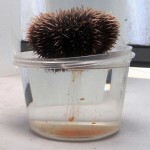 Female sea urchin releasing her eggs into a container. 2. Once the gametes are collected, they are combined together and placed into large cylinder tanks. Because the urchin larvae are free-swimming, they must constantly be suspended in the water column. The larvae will live in these tanks eating to their hearts content on phytoplankton, and go through a variety of growth stages that take approximately three weeks. 3. After approximately three weeks, the larvae eventually settle and take the shape of a true urchin. Because they are still very tiny (ranging from the tip of a pencil to a thumbtack), their mouths are very small. This allows the larvae to feed on the biofilm that naturally grows inside the tanks for 1-2 months. As the urchins start to grow and their mouths get larger, they eventually transition over to macro-algae. At this stage they really start to grow quickly! 4. 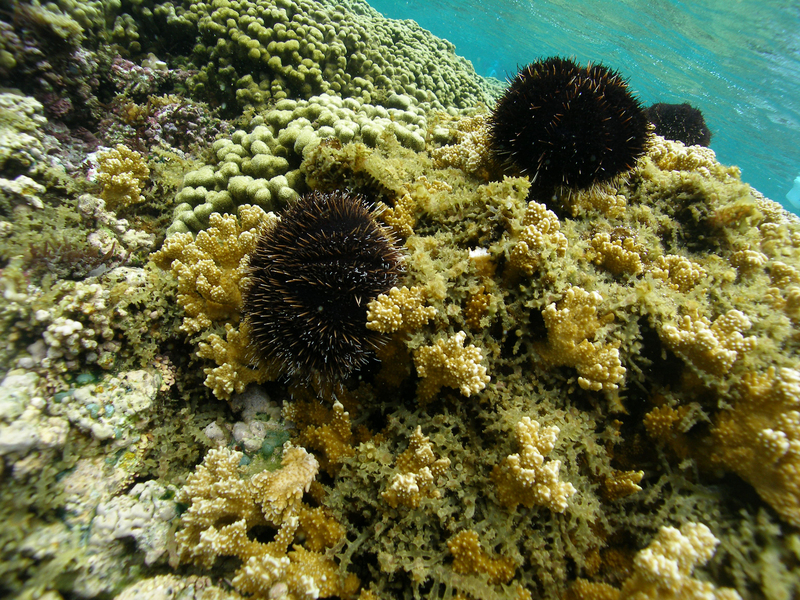 After approximately 4-5 months the urchins are large enough (about the size of a quarter) to be handled and transplanted to their new homes on the reef. Once released, they quickly go into hiding. Juvenile urchins munch away on the invasive algae, and soon grow too large to hide in holes on the reef. Eventually, the urchins emerge and spend the rest of their days slowly moving across the reef in search of their next meal.